Is Silver’s long bear market over? If so, it would be exciting news for bulls who have suffered through a hellacious, 72% correction since the metal peaked in 2011 just beneath $50. The monthly chart (see inset) provides reason for cautious optimism, implying as it does that Comex futures could be bottoming slightly above $15. If a powerful and sustained upturn lies in the offing, the September contract would need to hold above 15.093, a midpoint ‘Hidden Pivot’ support shown in the chart (see inset). It bounced precisely from this number a year ago and is trying to hold above it now. A small breach of a few pennies would not likely prove fatal, but a more decisive one of perhaps 30-40 cents would. That would probably doom this vehicle to a further slide to at least 12.221, the pattern’s ‘secondary’ Hidden Pivot, or even to the ‘D’ target at 9.350 (although I seriously doubt things will get that ugly). The pattern from which I have derived these targets is a textbook-perfect beauty, and that’s why I have strong confidence in it. Accordingly, I would suggest using it regularly to get an accurate ‘read’ on Silver’s price action in the weeks and months ahead. 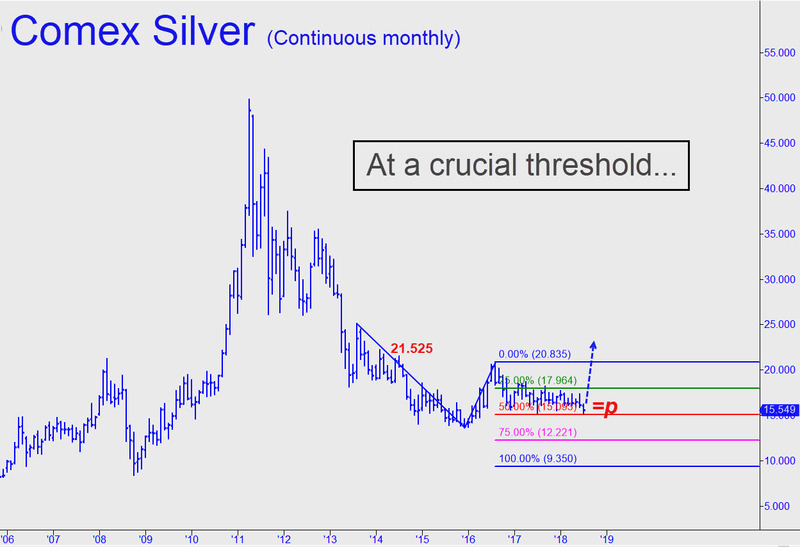 The chart further suggests that Silver must push above a peak at 21.525 recorded in July 2014 to launch a sustainable move that would have the potential to reach 55.055. As a practical matter, we needn’t wait for Silver to rally above 21.525 to take speculative long positions with risk under very tight control. That is possible from current levels, using the hourly chart, which would turn impulsively bullish with a push above 15.595. If you don't subscribe to Rick's Picks, just click here for a free two-week trial. It will give you instant access not only to the chat room, but to actionable 'touts', intraday alerts, ‘jackpot’ bets using super-leveraged options and impromptu ‘requests’ sessions online. Rick's Picks publishes stock, commodity, and mini-index trading recommendations and forecasts based on a proprietary technical analysis method that took more than ten years to develop and hone.